HM699-010, Ithaca Pub Table, by Howard Miller. On select hardwoods and veneers, the Ithaca Pub Table comes designed with a light distressing & Hampton Cherry finish. Center of the table top is removable & reversible to choose between a dining or a games surface. In the well below, an upholstered backgammon board comes included. Ithaca Pub Stool (HM697-010): Stool designed with a brown faux leather seat cushion. Standard Wood - Hampton Cherry finish with a light distressing. 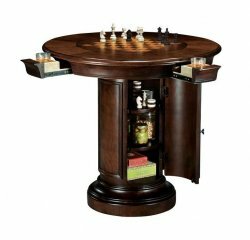 Please Note: Stools are only sold in conjunction with the purchase of a games table.